Len became Club Secretary in Nov 2017, taking over from Mike Hutchinson who had done the job for an impressive 21 years. The role entails the usual run-of-the-mill secretarial duties, with flurries of activity at certain times of year, notably the AGM in November. Len will also act as 'go-between' when Cycling UK wants feedback on Policy matters, and also ' service' meetings of the 9 member Group Committee. As Chair of Lancaster and South Lakes CTC, Nick presides at each meeting of the Club's Committee and at the Annual General Meeting. His role is to make these meetings run efficiently and in accordance with the Constitution and the Policy Handbook for Cycling UK Member Groups. He also deputises for the Club Secretary when needed. Mike didn’t get a bike until he was 13, so he’s only been cycling for 62 years. In the last 25 years, he and his wife, Jan, have cycled in Holland, Luxembourg, Belgium, France and Germany. Mike didn’t take up cycling in groups until after moving to Lancaster, he met a bunch of old geezers in 2008 outside the nearby supermarket; “The Thursday Riders”. He was soon putting together their programme of weekly rides and, once, the group had affiliated with Cycling UK, Mike took on planning of the Lancaster and South Lakes CTC group Sunday Rides as well. Nigel has rediscovered the joys of cycling and extensive opportunities to explore the local area with C.T.C. He tries to make it to most Sunday rides and has been persuaded to lead one or two. 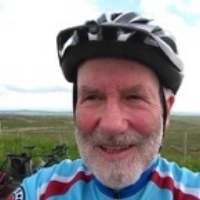 Now retired, he also enjoys cycling away from home on holidays in the UK and Europe and sees the bicycle as the best way to travel and to appreciate the countryside and the views and really wants to keep stopping to take photographs. I started riding with the Club in 2005, having previously been a member of Burnley and Pendle CTC. My role is to organise social events and Club trips and holidays. I welcome suggestions about the sort of events you would enjoy. Tracey is a vocal and social member of the group since 2010 when freedom from childcare beckoned. When quiet, she’s probably climbing a hill (usually near the front of the group) and when not, easy to locate in the crowd. Tracey is usually out on Tuesdays, Thursdays, and sometimes Sundays (with spouse Peter) - if the weather is fair! She is very welcoming and inclusive, and will happily chat on any subject; cycling or otherwise. Always ready to lend an ear and helpful advice to all riders, as Welfare Secretary, Tracey's role is to help resolve any issues within the group and make sure all members are treated fairly. Frank cycles regularly with the CTC and the Tandem Club. His photo-journalistic assignments on behalf of both have taken him all over the UK and Europe, with material for published reports gathered from as far afield as Holland, Belgium, France, Germany, Luxembourg and Poland. Oh, and he skis, too! When Brian was the local secretary of the Rambler’s Association and a member of the Friends of the Earth when they prepared ‘Lancaster Cycleways’ in 1974. This document became the City Council's blueprint for the conversion of ex-railway lines to the present network of cycle paths. It provided the original idea behind the 130 mile 'North Lancashire Cycleway'. As a competitive cyclist in Lancaster Cycling Club and the Lune Racing Cycling Club, Brian planned and organised, the Lune’s Reliability Ride – The Coal Road Challenge. 67 miles through Lunesdale and the Dales, this included the climb from Garsdale Head to Dent. He has now taken on the role as group Campaign Coordinator. Tim wasn't allowed to have a bike as a teenager... so he borrowed one off a mate. Now he has a few of his own. Retirement means he has the time to fiddle with the web pages and even Facebook. Contact details for all committee members are on the Club members only page.